Gvozd' [Nail], no.2, January 29, 1906. Published by I. M. Muravkin. Edited by I. M. Muravkin. St. Petersburg. Typography: Parovaia tipolitografiia of A. V. Orlov. Literary journal of art and satire. This issue contains poetry, prose, pictures and illustrations. 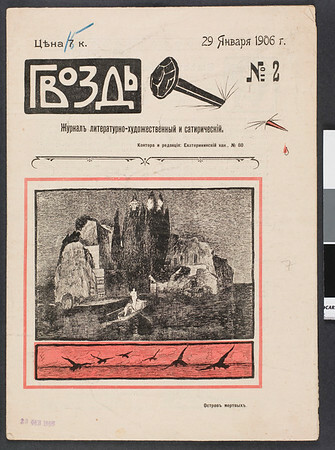 Issue numbers 1 and 3 were "arrested" at the typography and destroyed, the first issue by the police, the third by order of the the censors (Botsianovskii and Gollerbakh, 212).